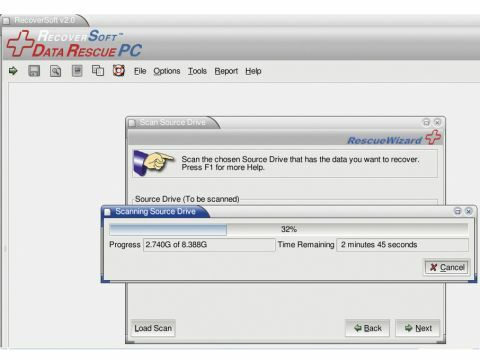 Data Rescue PC is a one-stop shop for recovering files from a problematic hard drive, and because it's equipped with its own OS it boots directly from the disc. Some recovery utilities can cause more damage to your hard drive and files by trying to fix the problem, instead of focusing on recovering your files. Our advice is don't use a repair utility until you've safely recovered your files and stored them in a safe location. As it happens, that's what Data Rescue PC does best. Simply insert the CD, reboot your PC and Data Rescue PC will access your drive and guide you through the file recovery process with step-by-step directions. Scanning your source drive is a slow process, but the progress bar is detailed enough to tell you exactly when it's going to finish. Select the files that you wish to recover and they'll be stored on your destination drive. You'll need a FAT32 partition to recover to, although the program can read data from any file system. Our experience with Data Rescue PC was a pleasant one. The interface might look like it predates Windows 95, but it's the data recovery aspect that matters and Data Rescue PC performs well. So what's new in version 2.0? The File Preview enables you to see files before recovering, and that goes for all file types. Raw Scan Recovery means you're able to find more files even after deletion, while Cloning images and scans a drive, enabling data to be moved to a new drive. There's also Network Support so you can recover to a network drive, which makes the Data Rescue PC a good buy for longevity considering the trend towards network storage. Another benefit is that you can attach your external drive at any time during the recovery process without rebooting. Because it's Vista-ready, if you've got any concerns about the robustness of your new or upgraded PC then we'd say Data Rescue PC v2.0 is a good buy.